Review by Steve Sucato for DanceTabs. Save Tchaikovsky’s brilliant original score there was little choreographer Mario Radacovsky’s psychological ballet Black Swan White Swan (retitled Black & White: Swan Lake for 2017) had in common with traditional productions of Swan Lake. No feather-adorned tutus, no clack of pointe shoes hitting the stage floor and no love story of prince and a beautiful swan that transcends death. His contemporary version of the Marius Petipa classic instead had its dancers in modern-day costume, often barefoot, and told the story of a self-absorbed man who, faced with his own mortality, sought refuge in romantic relationships with two very different women only to be tormented by feelings of guilt and betrayal over his infidelities with them. 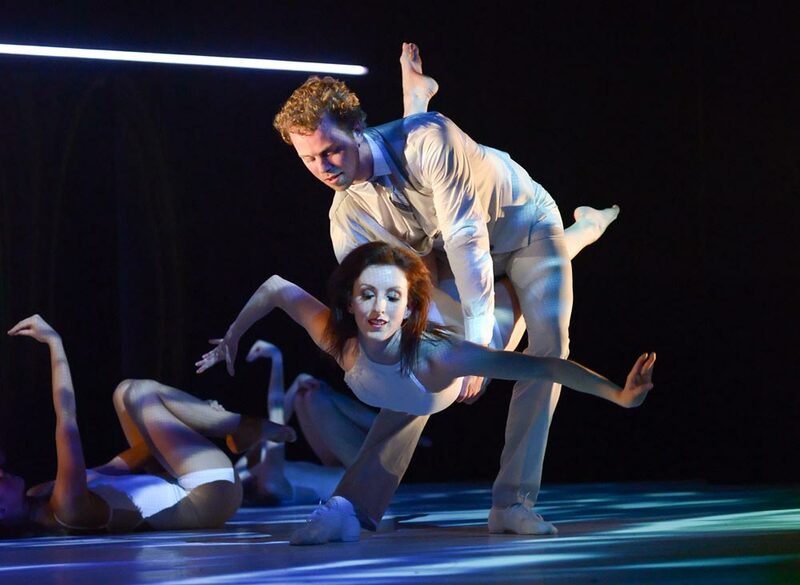 The world premiere of the black-and-white themed two-act ballet by Grand Rapids Ballet (GRB) at the Peter Martin Wege Theatre began with a darkened stage on which the moving image of the surface of a shimmering lake was projected. The lake’s waters gradually became more turbulent as apparition-like circles of white light rose from its depths. Apart from the ballet’s leads, GRB’s dancers appeared at times uneasy in Radacovsky’s gesture-laden contemporary movement language; their dancing lacked energy and crispness. The rest of the ballet saw Siegfried seemingly defeat Von Rothbart only to have him return when the White and Black Swans met each other and exposed Siegfried’s infidelities. The ballet ended with Siegfried and Von Rothbart lying lifeless on the stage as the projected image of a swan in flight surrounded them and GRB’s swan corps slowly flapped their arms to Tchaikovsky’s stirring music. Perhaps not a production for the ballet purist and in some ways a flawed one, Radacovsky’s ballet was nonetheless a triumph. For GRB, now in its 40thseason and the second under new artistic director and former Pacific Northwest Ballet prima ballerina, Patricia Barker, Black Swan White Swan was bold and successful step in the new direction Barker is taking the company from a little-known regional ballet company to one in the national spotlight.